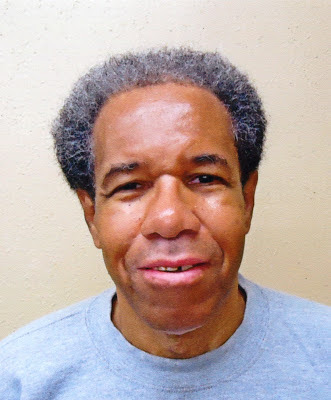 A federal judge in Louisiana issued an unconditional writ of habeas corpus, ordering the immediate release of the Angola 3’s Albert Woodfox, and barring the State from creating a retrial. He could be released within hours or days after more than 43 years in solitary confinement. Sixteen years longer than the imprisonment of Nelson Mandela. A federal judge argues that the State of Louisiana can’t be trusted to provide a fair trial. Think about that. Think about that hard. Woodfox has been held in solitary confinement since 1972 for the murder of corrections officer Brent Miller at the Louisiana State Penitentiary at Angola. Many believe that he and the other two members of the so-called Angola 3 were targeted for the crime, and subsequently held in isolation, not because of the evidence but because of their involvement in the prison’s chapter of the Black Panther Party. Woodfox is the only member of the Angola 3 to remain in prison. Robert King was freed in 2001, following 29 years in solitary, after his original conviction for a separate prison murder was overturned. Herman Wallace, whose conviction for Brent Miller’s murder had also been overturned, died last year after more than 41 years in solitary and a few days of freedom. 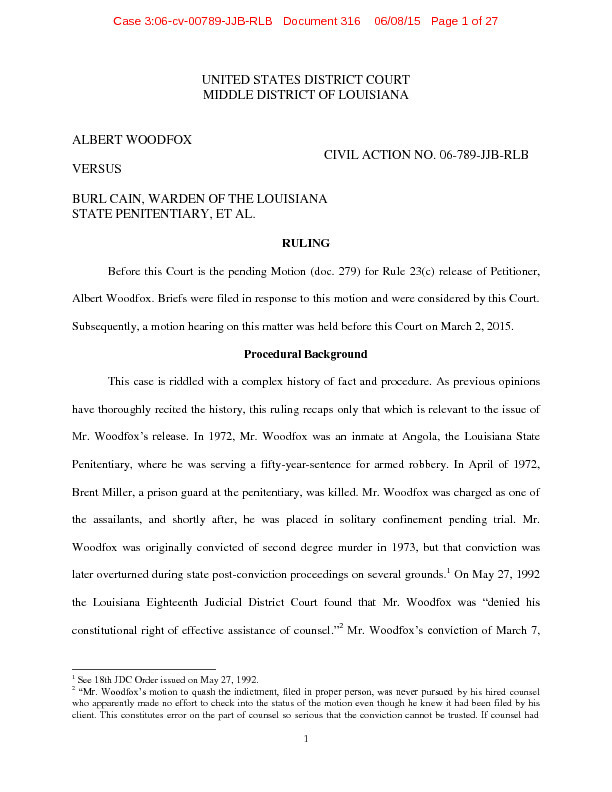 In 2013 Judge Brady also vacated Woodfox’s conviction on the grounds that there had been racial bias in the selection of grand jury forepersons in Louisiana at the time of his indictment. Last November, the Fifth Circuit, considered one of the nation’s most conservative Federal Appeals Courts, voted to uphold Brady’s ruling. Caldwell asserts that the evidence against Woodfox is “overpowering”: “There are no flaws in our evidence and this case is very strong,” he said last year. But these statements belie the fact that much of the evidence that led to Wallace and Woodfox’s conviction has since been called into question. In particular, the primary eyewitness was shown to have been bribed by prison officials into making statements against the two men. Solitary Watch’s James Ridgeway first wrote about the Woodfox case in 2009 in Mother Jones, providing a comprehensive history and analysis, as well as an account of the conditions in which Woodfox has lived for four decades. Woodfox’s conditions of confinement have if anything deteriorated in the last five years: He was moved from Angola to David Wade Correctional Center in north central Louisiana, where, according to a separate lawsuit, he faced multiple daily strip searches and visual body cavity searches. Woodfox, along with Robert King and the estate of Herman Wallace, is also plaintiff in a major federal lawsuit challenging his decades in solitary on First, Eighth, and Fourteenth Amendment grounds. That suit may also finally come to trial this year. 43 years in solitary confinement, always claiming his innocence, and patently obviously because of his political beliefs. Repeatedly denied proper reviews. Repeatedly denied a chance to get out of solitary. Suffering psychological scarring that can only be imagined. In the land of the free. Bow your head and weep, America. Having signed many a petition for his release, I expect to get updates from petition authors as soon as they get up. But I heard it here first. Thank you. Some of us are weeping – but far too few – and there are many, many injustices to weep over. I recommend you not hold your breath waiting for those who are not weeping to do so. Not sure, but I admire his open-ness. It is a happy day, but it is hard to be happy after such an egregious, blatant and awful miscarriage of justice. Anyhow – on we go, one step at a time. I wish the community groups in Cleveland good luck and commend them for their initiative. There would have been charges to answer in the Tamir Rice case in any other civilised country in the world by now.